Clark Junior College, Vancouver, WA., circa 1971. ​​Set on a hill just north of Goldendale, this Washington State Park Heritage Site has attracted hundreds of thousands of visitors since its dedication in 1973. 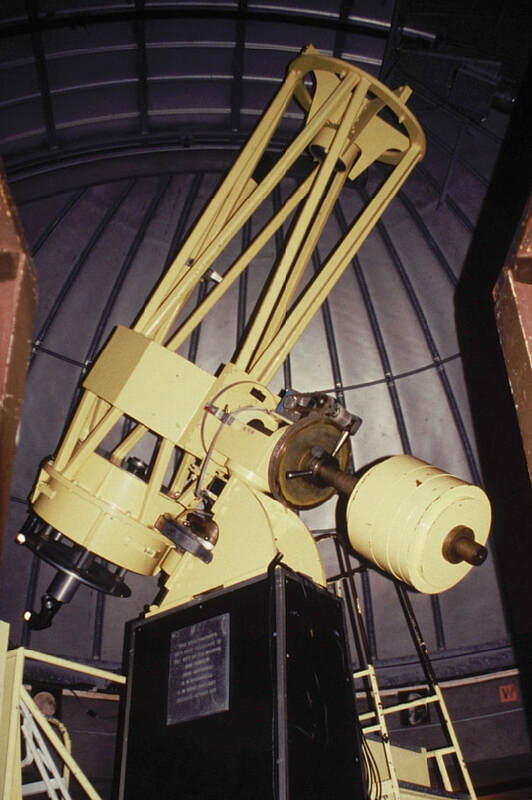 The Goldendale Observatory resulted largely from the efforts of four amateur astronomers based at Clark College in Vancouver, Washington: Don Conner, Mack McConnell, John Marshall, and Omer VanderVelden, who in the 1960's constructed what would become the largest amateur-built telescope of its day. It was originally intended to replace a 12 inch telescope they had previously made for use by the College and its students. They volunteered almost six years in building the telescope and grinding, polishing, and figuring the primary and secondary mirrors; Clark College contributed over $3,000 for materials ($24,000 in today's dollars). 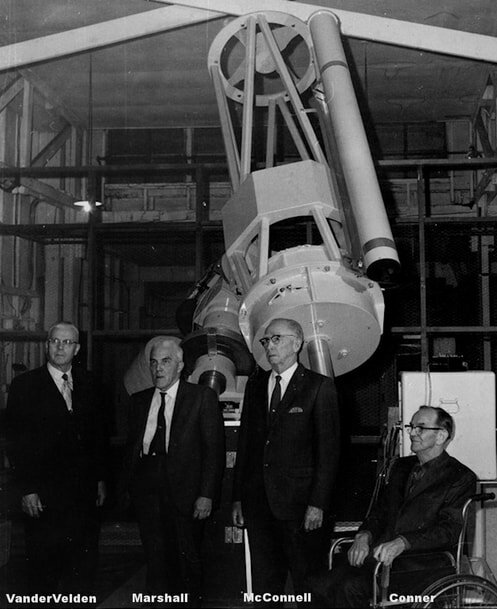 At the time of its completion, the telescope was valued at $50,000 (about $272,000 today). 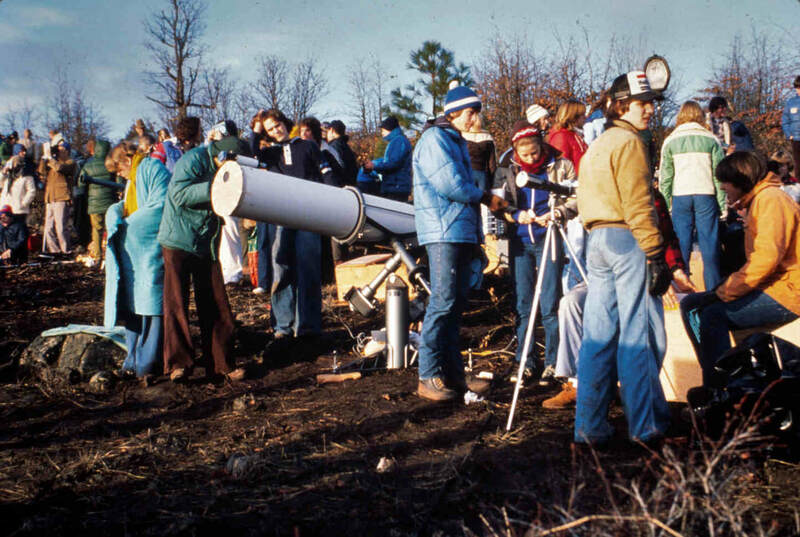 However, due to the at times less than ideal weather conditions and a large amount of light pollution from nearby Portland and Vancouver, it was realized the telescope could not be used to its full potential if it was sited on the campus. The College sought a better location for the instrument which would remain relatively close to the Portland/Vancouver metropolitan area. Locations just to the east of the Cascade Mountains along the Columbia River were prime contenders for the telescope due to the clearer and dark skies and good highway access. The small Washington town of Goldendale - a two hour drive east of Vancouver - expressed interest. 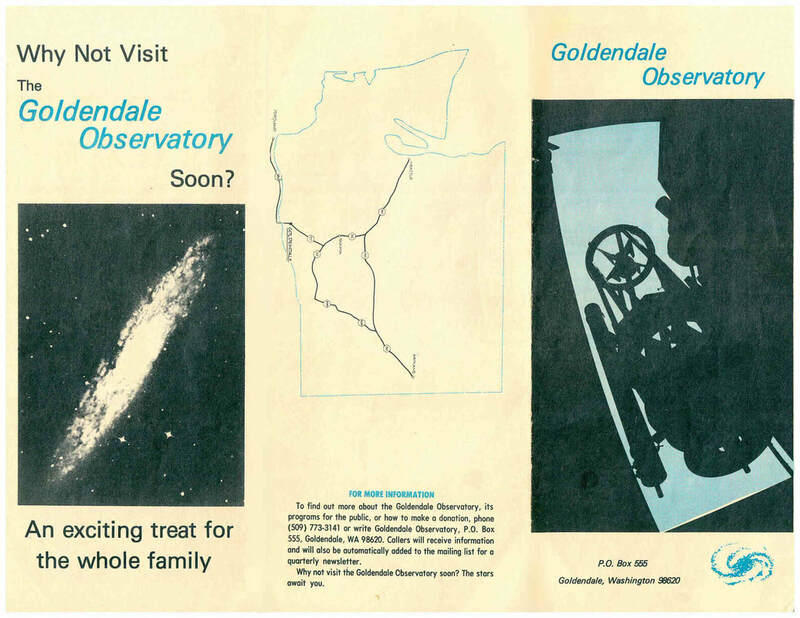 Even though it was relatively small, there were concerns about lights from Goldendale affecting the telescope. The City leaders promised to to build an observatory for the instrument and enact lighting regulations to protect it from light pollution. The non-profit Goldendale Observatory Corporation, led by a volunteer board of directors, which included one of the telescope makers and Clark College representatives, formed to solicit grants and donations to build the facility to house the telescope. 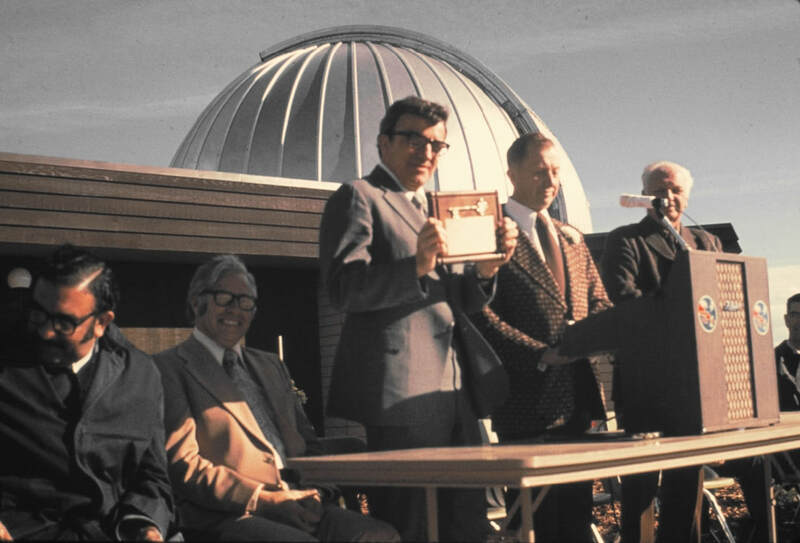 The Corporation anticipated the mission would be for use by the general public, amateur astronomers, local schools, and regional colleges for student lab purposes, including deep-sky photography and spectrographic study of distant stars and nebulae. Funds for the building (80%) came via a federal grant of $156,000 (about one million dollars today), and a smaller bank loan and donations paid for the 20% matching funds. Clark College then gave the 24 inch reflecting telescope to the City of Goldendale -- the designated recipient for the federal funds -- and the Observatory was built over a period of several months and dedicated on October 13, 1973. The Corporation leased the Observatory from the City and agreed to provide for its operation. Unfortunately, the Observatory closed immediately after opening, as no funds were left to operate the facility, and it sat mostly idle (except for occasional public use supported by amateur astronomers from Portland-Vancouver and Seattle) for over two years until the Corporation could afford to hire a full-time director who had degrees in astronomy and physics. 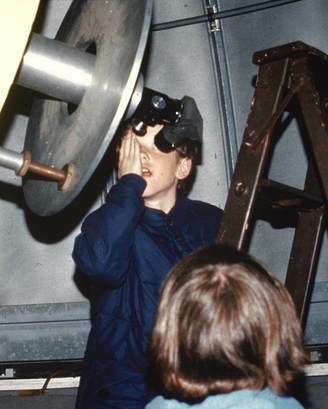 The Observatory emphasized the use of the facility by the public, schools, and amateur astronomers. It included a kitchen facility for overnight stays, and had a darkroom for processing photographs taken with the instrument. 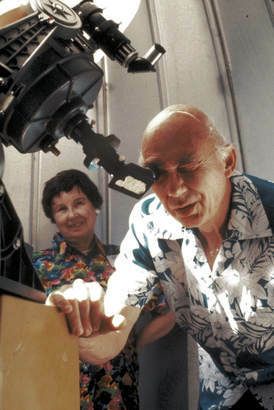 The Observatory offered presentations by amateur astronomers and experts in science and astronomy, showings of science films and hosted public speakers, science workshops, and classes in telescope making and photography. 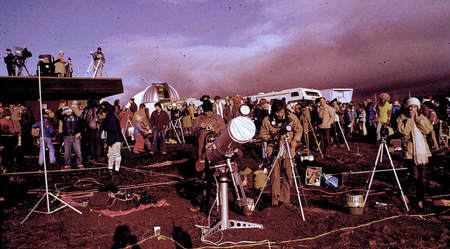 The Observatory became famous with the February 26, 1979 total solar eclipse, as thousands of visitors and the news media descended on the town of Goldendale for the event, and NBC-TV provided live television broadcasts of the eclipse to the nation. The Astronomical League held their annual gathering of amateur astronomers in Goldendale specifically for the eclipse, and they generously shared their telescopes with the public. 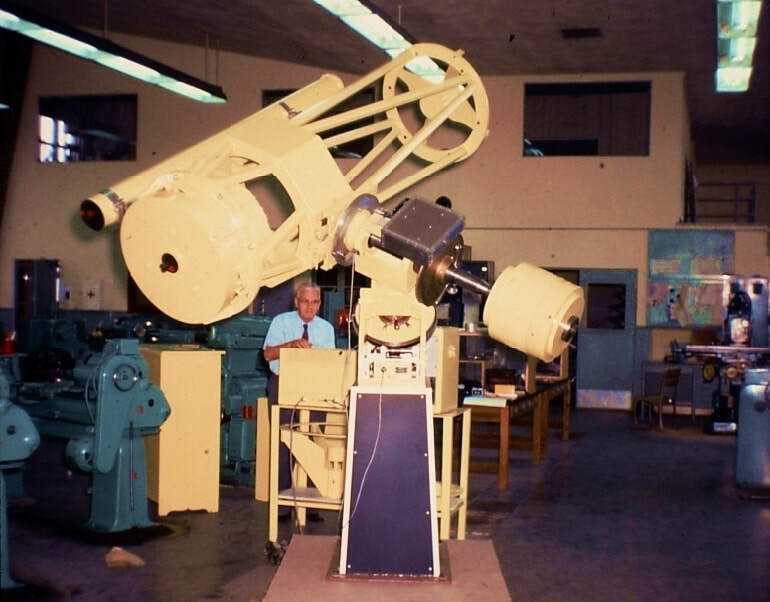 1979 was also the year the City of Goldendale and surrounding Klickitat County finally adopted the lighting codes which were originally promised years earlier to protect the night sky for the telescope. The Corporation experienced ongoing financial difficulties in repaying the bank loans and staffing the Observatory. In December 1980 the State Parks Commission agreed to purchase the site for the bargain price of $100,000, which paid off the Corporation creditors. The Parks Commission assumed full operation on July 1, 1981. 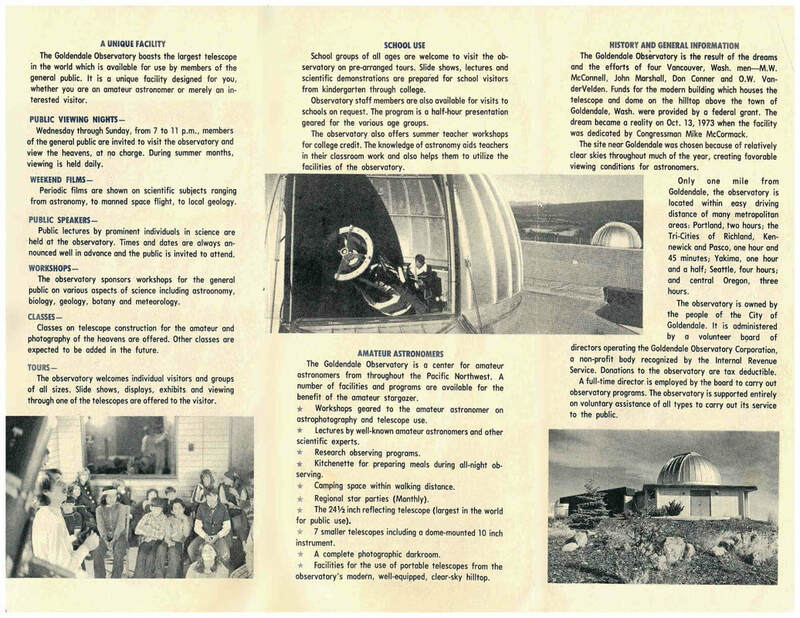 The Corporation then transitioned to become the Friends of Goldendale Observatory, which now acts in an advisory capacity, and to help support the mission to further public science and astronomy education. For almost four decades, the Goldendale Observatory State Park has provided public education and views of the heavens with a full-time Interpretive Specialist, part-time Park Aids, as well as volunteers. In 2010 the Observatory was awarded one of the first International Dark Sky Park designations by the International Dark-Sky Association. In 2017, the IDA removed the Observatory as a Dark Sky Park due to concerns over the failure of State Parks to meet the agreed upon obligations for dark sky education and conservation advocacy, and noted the apparent neglect of Goldendale and Klickitat County to implement their longstanding regulations for protection of the Observatory's night sky. ​"Van" VanderVelden at the telescope controls in the Clark College machine shop in Vancouver, Washington, where the massive 24 inch telescope was built over several years in the late 1960's. The completed telescope installed in its new observatory. Dedication ceremony October 13, 1973. Nighttime, as well as daytime solar observation, has been a consistent theme for public education at the Observatory. 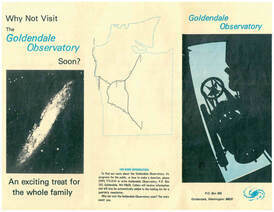 ​Descriptive brochure informs about the early Goldendale Observatory Programs. ​Thousands of people traveled to Goldendale to see the 1979 total solar eclipse, which made the Goldendale Observatory famous. ​​​For over 30 years, Washington State Parks Interpretive Specialist Steve Stout emphasized the importance of conservation of the Goldendale Observatory night sky. Stout again brought world-wide recognition to the Observatory with International Dark Sky Park certification in 2010. 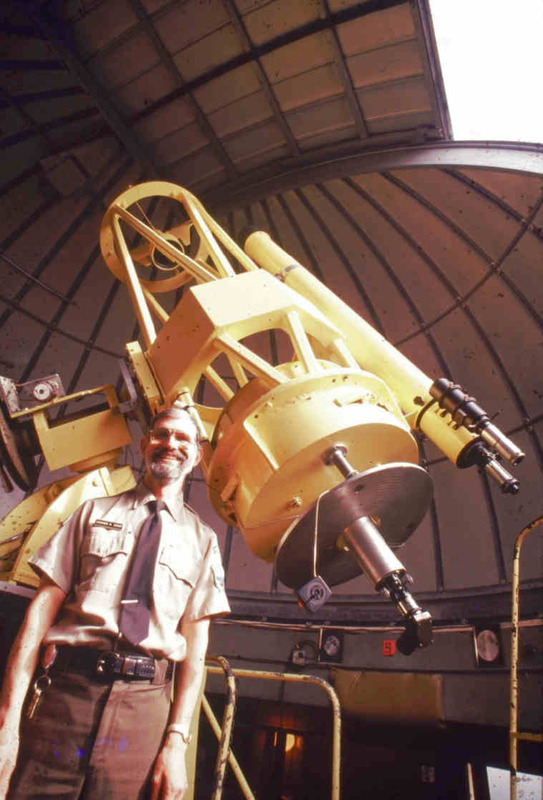 ​Unfortunately after Stout retired, the Observatory lost this prestigious designation due to Washington State Park's management and the Observatory's staff's failure to meet the certification requirements State Parks had agreed to: Provide dark sky public education programs, and to earnestly advocate for conservation and protection of the Observatory's night sky. ​Area Manager Lem Pratt (left) and Interpretive Specialist Troy Carpenter (right) are responsible for the first ever Dark Sky Park revocation in the history of the Dark Sly Places program of the International Dark-Sky Association.